For other uses, see Black Wednesday (disambiguation). In politics and economics, Black Wednesday refers to 16 September 1992, when the British Conservative were forced to withdraw the pound sterling from the European Exchange Rate Mechanism (ERM) after it was unable to keep the pound above its agreed lower limit in the ERM. George Soros, the most high-profile of the currency market speculators, made over £1 billion in profit by short selling sterling. However, in 1997, the UK Treasury estimated the cost of Black Wednesday at £3.4 billion. In 2005, documents released under the Freedom of Information Act revealed that the actual cost may have been slightly less, £3.3 billion. The trading losses in August and September were estimated at £800 million, but the main loss to taxpayers arose because the devaluation could have made them a profit. The papers show that if the government had maintained $24 billion foreign currency reserves and the pound had fallen by the same amount, the UK would have made a £2.4 billion profit on the pound sterling's devaluation. When the ERM was set up in 1979, the United Kingdom declined to join. This was a controversial decision, as the Chancellor of the Exchequer, Geoffrey Howe, was staunchly pro-European. His successor Nigel Lawson, a believer in a fixed exchange rate, admired the low inflationary record of West Germany. He attributed it to the strength of the Deutsche Mark and the management of the Bundesbank. Thus, although the UK had not joined the ERM, from early 1987 to March 1988 the Treasury followed a semi-official policy of 'shadowing' the Deutsche Mark. Matters came to a head in a clash between Lawson and Prime Minister Margaret Thatcher's economic adviser Alan Walters, when Walters claimed that the Exchange Rate Mechanism was "half baked". 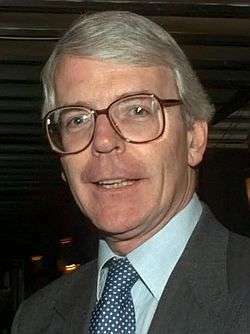 This led to Lawson's resignation as chancellor to be replaced by his old protégé John Major, who, with Douglas Hurd, the then Foreign Secretary, convinced the Cabinet to sign Britain up to the ERM in October 1990, effectively guaranteeing that the British government would follow an economic and monetary policy preventing the exchange rate between the pound and other member currencies from fluctuating by more than 6%. On 8 October 1990, Thatcher entered the pound into the ERM mechanism at DM 2.95 to the pound. Hence, if the exchange rate ever neared the bottom of its permitted range, DM 2.773, the government would be obliged to intervene. With UK inflation at three times the rate of Germany's, interest rates at 15% and the "Lawson Boom" about to bust, the conditions for joining the ERM were not favourable at that time. From the beginning of the 1990s, high German interest rates, set by the Bundesbank to counteract inflationary effects related to excess expenditure on German reunification, caused significant stress across the whole of the ERM. The UK and Italy had additional difficulties with their double deficits, while the UK was also hurt by the rapid depreciation of the United States Dollar – a currency in which many British exports were priced – that summer. Issues of national prestige and the commitment to a doctrine that the fixing of exchange rates within the ERM was a pathway to a single European currency inhibited the adjustment of exchange rates. In the wake of the rejection of the Maastricht Treaty by the Danish electorate in a referendum in the spring of 1992, and announcement that there would be a referendum in France as well, those ERM currencies that were trading close to the bottom of their ERM bands came under pressure from foreign exchange traders. In the months leading up to Black Wednesday, Soros had been building a huge short position in pounds sterling that would become immensely profitable if the pound fell below the lower band of the ERM. Soros recognized the unfavourable position at which the United Kingdom joined the ERM, believing the rate at which the UK was brought into the Exchange Rate Mechanism was too high, their inflation was also much too high (triple the German rate), and British interest rates were hurting their asset prices. The UK government attempted to prop up the depreciating pound to avoid withdrawal from the monetary system the country had joined two years previously. John Major raised interest rates to 10 percent and authorised the spending of billions worth of foreign currency reserves to buy up the sterling being sold on the currency markets but the measures failed to prevent the pound falling below its minimum level in the ERM. The Treasury took the decision to defend the sterling's position, believing that to devalue would be to promote inflation. Soros' Quantum Fund began a massive sell-off of pounds on Tuesday, 15 September 1992. The Exchange Rate Mechanism stated that the Bank of England was required to accept any offers to sell pounds. However, the Bank of England only accepted orders during the trading day. When the markets opened in London the next morning, the Bank of England began their attempt to prop up their currency as per the decision made by Norman Lamont and Robin Leigh-Pemberton, the then Chancellor of the Exchequer and Governor of the Bank of England respectively. They began buying orders to the amount of 300 million pounds twice before 8:30 AM to little effect. The Bank of England's intervention was ineffective because Soros' Quantum Fund was dumping pounds far faster. The Bank of England continued to buy and Quantum continued to sell until Lamont told Prime Minister John Major that their pound purchasing was failing to produce results. At 10:30 AM on 16 September, the British government announced a rise in the base interest rate from an already high 10 to 12 percent to tempt speculators to buy pounds. Despite this and a promise later the same day to raise base rates again to 15 percent, dealers kept selling pounds, convinced that the government would not stick with its promise. By 7:00 that evening, Norman Lamont, then Chancellor, announced Britain would leave the ERM and rates would remain at the new level of 12 percent; however, on the next day interest rate was back on 10%. It was later revealed that the decision to withdraw had been agreed at an emergency meeting during the day between Norman Lamont, Prime Minister John Major, Foreign Secretary Douglas Hurd, President of the Board of Trade Michael Heseltine, and Home Secretary Kenneth Clarke (the latter three all being staunch pro-Europeans as well as senior Cabinet Ministers), and that the interest rate hike to 15% had only been a temporary measure to prevent a rout in the pound that afternoon. Other ERM countries such as Italy, whose currencies had breached their bands during the day, returned to the system with broadened bands or with adjusted central parities. Even in this relaxed form, ERM-I proved vulnerable, and ten months later the rules were relaxed further to the point of imposing very little constraint on the domestic monetary policies of member states. The effect of the high German interest rates, and high British interest rates, had arguably put Britain into recession as large numbers of businesses failed and the housing market crashed. Some commentators, following Norman Tebbit, took to referring to ERM as an "Eternal Recession Mechanism" after the UK fell into recession during the early 1990s. While many people in the UK recall Black Wednesday as a national disaster, some conservatives claim that the forced ejection from the ERM was a "Golden Wednesday" or "White Wednesday", the day that paved the way for an economic revival, with the Conservatives handing Tony Blair's New Labour a much stronger economy in 1997 than had existed in 1992 as the new economic policy swiftly devised in the aftermath of Black Wednesday led to re-establishment of economic growth with falling unemployment and inflation. Monetary policy switched to inflation targeting. The economic performance after 1992 did little to repair the reputation of the Conservatives. The government's image had been damaged to the extent that the electorate were more inclined to believe opposition arguments of the time – that the economic recovery ought to be credited to external factors, as opposed to good government policies. The Conservatives had recently won the 1992 general election, and the Gallup poll for September showed a 2.5% Conservative lead. By the October poll, following Black Wednesday, their share of the intended vote in the poll had plunged from 43% to 29%, while Labour jumped into a lead which they held almost continuously (except for several brief periods such as during the 2000 Fuel Protests) for the next 14 years, during which time they won three consecutive general elections under the leadership of Tony Blair (who became party leader in 1994 following the death of his predecessor John Smith). The stock market went up about 8% over the next two days, so it was worth about the same for outsiders. ↑ Litterick, David (13 September 2002). "Billionaire who broke the Bank of England". The Daily Telegraph. London, UK. Retrieved 24 February 2013. ↑ Tempest, Matthew (9 February 2005). "Treasury papers reveal cost of Black Wednesday". The Guardian. London, UK. Retrieved 26 April 2010. ↑ Financial Times, 10 February 2005. ↑ "Not while I'm alive, he ain't – Part 4 Thatcher and Lawson". The Westminster Hour. BBC Radio 4. 15 May 2003. ↑ Sebastian Mallaby (10 June 2010). More Money Than God: Hedge Funds and the Making of a New Elite. Penguin Press HC. ISBN 9781594202551. ↑ Bootle, Roger (28 April 2008). "Pound fall is UK's get-out-of-jail-free card". The Daily Telegraph. London, UK. ↑ Litterick, David (13 September 2002). "Billionaire who broke the Bank of England". Telegraph. Retrieved 16 May 2014. ↑ Tebbit, Norman (10 February 2005). "An electoral curse yet to be lifted". The Guardian. London, UK. Retrieved 30 December 2008. ↑ "A strong-arm policy is needed to hold the pound down on the rebound". Roger Bootle. London, UK: The Telegraph. 15 May 2009. 1 2 Kaletsky, Anatole (9 June 2005). "The reason that Europe is having a breakdown...it's the Euro, stupid". The Times. UK. Retrieved 30 December 2008. ↑ Archived 16 October 2011 at the Wayback Machine. ↑ "Inflation Targeting Has Been A Successful Monetary Policy Strategy". NBER. Retrieved 31 October 2016. ↑ "Targeting Inflation: The United Kingdom in Retrospect" (PDF). IMF. Retrieved 31 October 2016. ↑ "Gallup spreadsheet". Retrieved 28 July 2014. ↑ "FTSE 100 heads for best month since exiting the ERM". The Telegraph. Retrieved 30 November 2016.